As I mentioned in a previous post, we just recently welcomed a new baby into our family. We are a bit exhausted (especially me) so I basically stayed in bed all morning today attempting to get a nap (and failing) while two of my other kids watched movies and entertained themselves. I was feeling like a lame mom by this afternoon... so I put together this fun heart activity for my 3 and 5 year old. 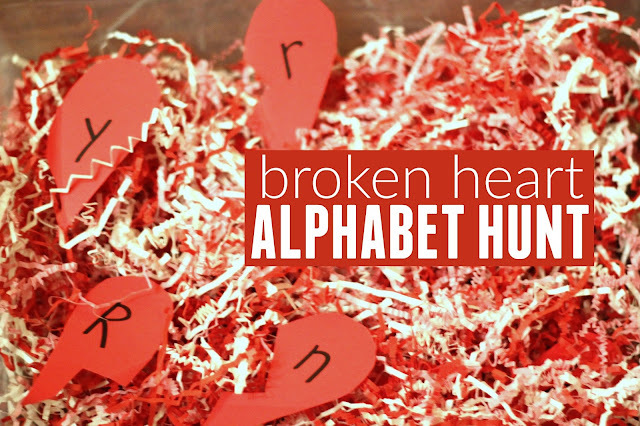 Crinkled shredded paper is one of our favorite sensory materials to play with, so I used it to make a simple broken heart alphabet hunt. We incorporated the letters in the kid's names since doing the whole alphabet would've been a bit overwhelming. To get started we cut out several red paper hearts (one for every letter in each child's name). 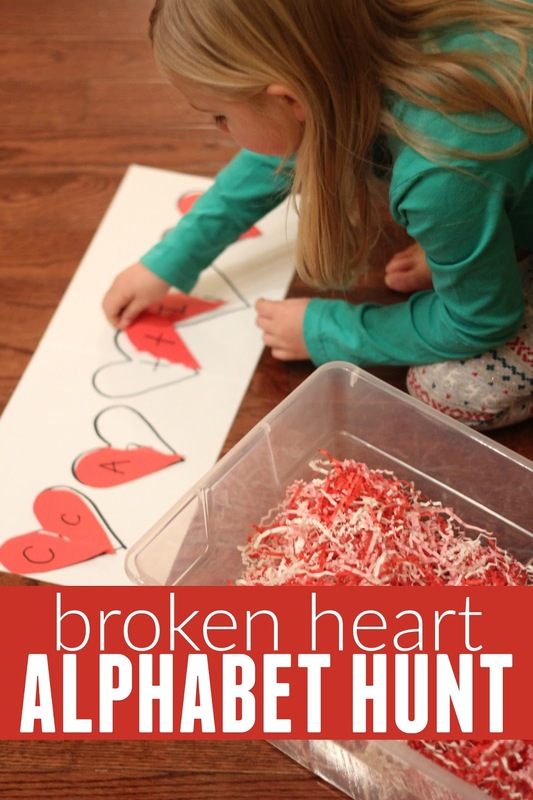 Then we turned the hearts into broken hearts (kind of like heart puzzles) and we wrote an uppercase letter on one half and the matching lowercase letter on the other half. Next we buried the heart pieces into a tub of crinkled shredded paper. Lastly, we drew whole heart outlines on a piece of paper and wrote a letter on each heart. Each child got a piece of paper that included hearts for every letter in their name. To get playing the hunt game the kids searched for the alphabet hearts inside the tub of crinkled paper. Once they found one they put it on their paper and hunted for the corresponding upper/lowercase letter. Once one kid was done, the other got a turn. They had so much fun with this that next time I'll set up two tubs so that they each have their own. While we played we talked about letter names and sounds. This is great visual discrimination activity as well as kids notice difference in upper and lowercase letters and can match uppercase to uppercase letters. Not only did the kids have fun doing this again and again, they also thought it was fun to hide the letters for me and let me play too. You could easily change this up to play with numbers, colors, shapes, etc. If you like heart crafts, you may want to check out our Valentine's Day pinterest board. You may also like our 7 favorite Valentine's Day crafts for toddlers. It is filled with loads of ideas! Love this, great idea to intoduce the alfabet! Love it! Great idea to introduce the alphabet!